A total of 23 A-Class enrolled in this regatta, that has been a classic year after year. The Championship began on Saturday May 5th and concluded on Sunday 6th, having held a total of 6 races: 4 on Saturday and 2 on Sunday. In this edition, the Foiling and Classic fleets competed together, the classifications were separated, having participated the best of the Catalan, Galician, Andalusian, Murcian and Valencian fleets. The weather conditions were awsome on Saturday, starting the first leg of the day with approximately 6 knots of wind and finishing the fourth race with about 12 knots. On Sunday, it was much more difficult because the wind did not exceed 7 knots all day, with descents up to 5 knots. 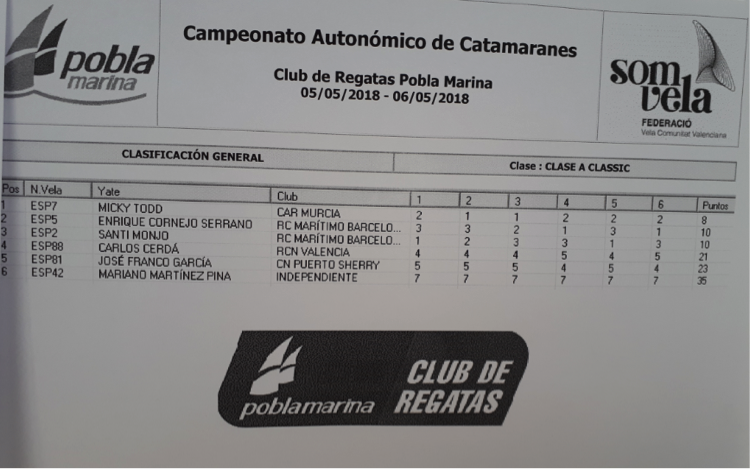 Already from the first legs of Saturday Manuel Calavia ESP-11 with his Exploder 2018 and Abdón Ibañez ESP-74 stood out in the classification. In the first race on Sunday Abdón arrived in first place with his DNA-F1 2017, being only one point away from Calavia (which was first in the ranking). 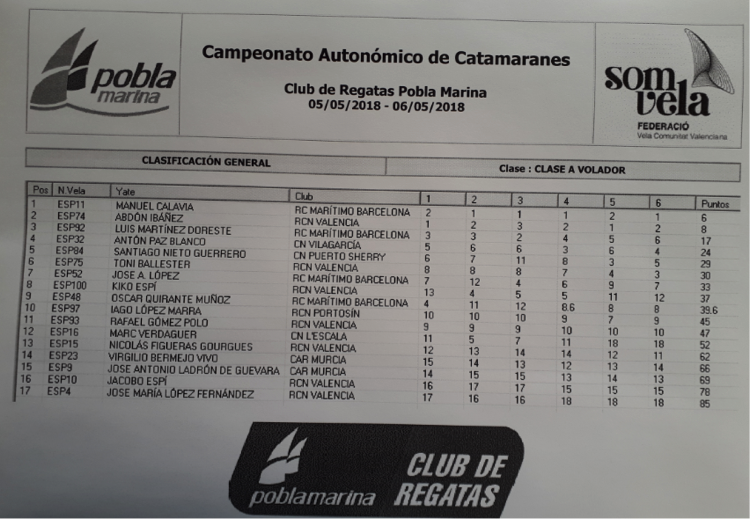 In the penultimate downwind of Sunday's last race, a starboard side of Calavia, together with a hard fight in the last upwind and a no less fought downwind, made Abdón lose all possibility of beating the gold (although winning the last race of the day, Ibañez would have been together in points with Manolo). 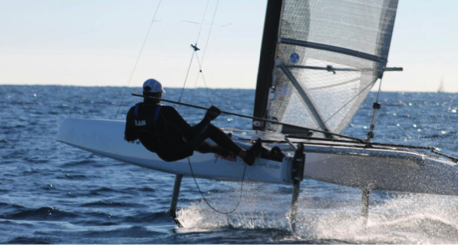 Also in this edition, the Olympic Luis Martínez Doreste ESP-92 with his 2014-refitting DNA shone in third place behind Calavia and Ibañez and the Olympic and gold in Beijing, Antón Paz ESP-32 with his Exploder 2017, which it was in fourth position. Behind were sailors like Santi Nieto ESP-84 with his Exploder 2017 and Toni Ballester ESP-75 in sixth position with his DNA-F1 2017 and Pepelu López ESP-52. 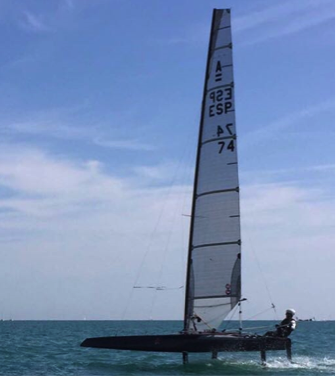 Interesting was the participation of Kiko Espí ESP-100 with his Exploder 2018 Fiberfoam short mast, brewin boomless sail that had brilliant moments on Saturday in the most wind pressure legs but could not finish on Sunday, punished by a rigging that apparently hurts him in the low pressure races. The Scottish Micky Todd ESP-7 once again shone in this edition obtaining a first place with his blue Scheurer after a lot of pressure from Enrique Cornejo ESP-5 Exploder 2017 with curved orzas and Santi Monjo ESP-2 with his DNA-2013, who did not stop fighting until the last moment.